At some point in the lifecycle of almost every company, a rebrand becomes the right choice to move forward. Lots of reasons may lead to a rebrand decision. These are just a few of the possible reasons a rebrand may be the right move. Regardless of the reason, if a rebrand is the logical next step in a company's evolution, it's no small undertaking. It can seem daunting for any size organization, but when broken down into tasks, a rebranding transition becomes much more manageable. 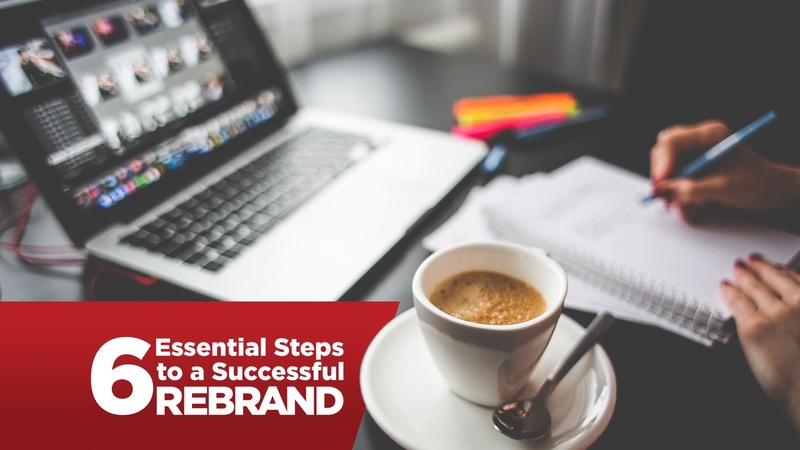 Here are six essential steps that can make rebranding a success. Gathering the right information before a rebrand is a critical step. Cutting corners at this point can result in wasted time and money later. Before the brand evolves, you have to know where it is today. Interview the leadership team and internal teams that have connections to customers. They can share insight on where things are right and where they are not. Those answers, while valuable, are still biased, however, so it's also best to also go straight to the source. Survey customers and yes, even prospects. Ask for honesty. It will often reveal truths that internal teams didn't even know existed. Finally, assess the competition. How does your company stack up? Combining all this information gives you a complete picture of where you are and better yet where you need to go. With valuable feedback in hand, it should be clear what parts of the brand are working well and which ones are not. At this point, it is brand promises should be the focus. These promises are the set of truths you always want people to see and expect from your company. What values are you not willing to compromise? Many companies carve out mission and vision statements as a part of this process, but the promises are deeper than that. They evoke feelings and emotions. The brand promises are your set of core values. They define your culture and how you interact with customers moving forward. Together, your core values, mission, and vision help solidify your goals. Write these goals down and incorporate them into your business plan. When in doubt, refer back to the promises. Does a decision fit with those promises? Every part of your brand should. Many confuse positioning with other parts of the brand process, but it is a component with a specific purpose. Positioning defines in explicit terms what you do, who you do it for, why you do it, and how you do it. If done right, positioning becomes a distilled version of the overall business plan. Positioning should also be detailed and specific in identifying your ideal customer and how you serve them. Instead of targeting a particular industry at large, dig deeper. Be specific. What size company is perfect for what you do? What amount of revenue must a company generate to be a good candidate for your products or services? Don't settle for generic answers in your positioning statement. How you do it should be specific as well. What sets you apart from the competition? Everyone might say service or quality, but what is your secret sauce that no one else has? Colors, design, and any marks that make up a logo should all reflect the values of the company. As such, the tagline should also reinforce those promises and give clues about what a company does and what they stand for as an organization. The first question every company undergoing a rebranding process must ask is how much brand equity the existing logo possesses. How well has that logo been entrenched in the minds of customers? Is the image in people's minds a good one? A very well known logo from a company people trust might only need tweaks to bring it into the modern age and reflect updated brand promises. Drastically changing an established logo, especially for consumer products, can create confusion and loss of sales. If, however, a company is in dire need of a new image from a sour brand, a new logo might be just the thing to "show" people that improvement is afoot. Either way, it's almost always best to keep the team reworking a logo small and focused. Too many voices can lead to endless revisions and ultimately a watered down solution. You've got an updated logo and mapped out your mission, vision, and brand promises. Great! Now what? A brand guide is a perfect tool to let everyone know how the brand should be used and perhaps more importantly how it shouldn't. Writing and designing new printed collateral and a new website should all feel like they come from one place with a singular vision. The rules that ensure that happens should all be spelled out in the brand guide. Details of color, fonts, logo usage, presentations, and even email signatures should be in the Brand Guide. Be specific. Take the guesswork out of writing style, image choices, and even ways that the logo should not be used. Be specific about the dos and don'ts of the brand you've worked so hard to create. That will make it easier to maintain consistency everywhere the brand is seen. Rebrand launches are exciting events. Before sending emails, sharing on social, or shouting about a new brand to the world, it's best to start at home. Share the new brand with the entire organization before anyone outside sees it. Host a brand launch party that showcases the new brand and how it should be represented. Make that party an event people will remember. They've contributed feedback to reach a new brand, so let them share in the excitement first before the rest of world sees the fruits of your labor. Once the buzz inside your walls is humming, plan external press releases, social media shares, and even a launch day event with customers if possible. Encourage others to share the new brand. Most of all, trust in the hard work that established the foundation upon with which your rebrand was built. Don't fall back on old brand habits. Form new ones and stay the course. Deciding if a rebrand is the right choice is a big decision that should not be taken lightly. If it is, these six steps form a general outline of the tasks that any rebrand should undertake. Successful rebrands build one step at a time, and each step builds upon the last. Want to put your brand back on track with a consistent and repeatable approach to everything you do? Download our FREE eBook Developing a Brand Guide Basick Brand Elements Every Company Needs.